Facebook says new face detection tech will help find friends, making photo tagging easier. (Mashable) -- Facebook has begun testing face detection technology for Facebook Photos. This is the first of what seems like a series of new features for its popular photo product. The tests, which some users will see starting today [Friday], focus on decreasing the tediousness of "tagging" friends in Facebook photos. In the current Photos feature, users upload photos, click on each face in a photo, tag that photo with the friend pictured therein and continue the process until the album is tagged. If you've got a large album or a lot of friends in a single photo, this process is inefficient and tedious. To solve this problem, Facebook has implemented face detection technology that will automatically find faces in photos and select them, eliminating one of the most tedious steps in tagging Facebook friends in photos. Your friends are already selected by the software -- all you have to do is answer the Facebook prompt, "Whose face is this?" The technology is the same as the facial detection technology most digital cameras use today. While the tech itself may not be all that new, it is a clever and very welcomed addition to the Facebook Photos feature set. The company also promises that face detection is merely the first of many improvements that they're trying out. It's also interesting that the post was written by Sam Odio, one of the co-founders of Divvyshot, which Facebook acquired back in April in order to improve the Photos product. What other improvements and features do you want to see implemented in Facebook Photos? 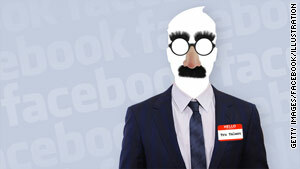 Do you think facial recognition -- that is, Facebook automatically knowing whose face is whose -- could be on the horizon? The company has a suggestion form for letting them know, but we also encourage you to share your ideas in our comments section below.